By Dr Anita Quye, Lecturer in Conservation Science, Centre for Textile Conservation. Exposing textiles coloured with light-sensitive natural and synthetic dyes to light is risky. Even under controlled museum conditions with ultraviolet and short wavelength visible light removed, these dyes can fade. Why? Because visible light still has enough energy to change the molecular structures of dyes and their colour (chromophoric) properties. When I am researching textiles in 18th c. and 19th c. dyeing manuals, I wonder about the fading risk for the light-sensitive dyes I expose to artificial lights in archival study rooms every time I turn a page. Could the wavelengths of visible light that dyes absorb most energy from for their colour be, ironically, the most damaging? Should and could dyed textiles be protected by filtered visible light? 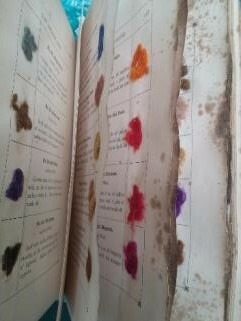 Dyed patterns in a 19th century dyeing manual – at risk of fading under ‘ideal’ museum lighting? ©Anita Quye, University of Glasgow, 2016. My thoughts led to enthused discussions with Malcolm Innes, an experienced museum lighting design consultant and research fellow at Edinburgh Napier University. The LED lights Malcolm uses in his designs are favoured by museums, galleries and archives for their low carbon footprint. Malcolm now works with spectrally-tuned LEDs, primarily for aesthetic lighting effects. If eliminating specific visible wavelengths reduces the fade of light-sensitive dyes, then tuneable LED lights are viable for their protection. The result is a 12-week pilot study for our collaborative Filtered Light Project, with Dr Jing Han as our research assistant. Our study innovatively combines exposing historically important light-sensitive textile dyes to visible light through narrow and broad bandpass filters with chemical analysis to assess chromophoric changes. Silks dyed with safflower, turmeric and magenta are being subjected to a daylight-through-glass equivalent in the CTC’s QSun XE1 light chamber under sequences of 10 nm and 60 nm bandpass filters spanning the visible light range. This follows much careful pre-planning and calculations to ensure the fabrics are exposed to comparable amounts of irradiance in the different light bands, plus a schedule to sample them at appropriate times to track and compare chemical changes to the dyes. 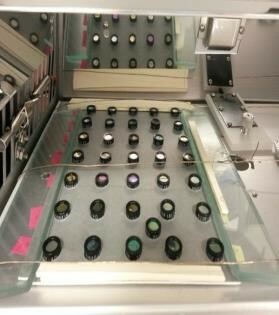 The exposed dyes are being analysed by the CTC’s ultra-high performance liquid chromatography with photodiode array detection (UHPLC-PDA) to assess chemicals changes to the dye chromophores even before noticeable colour loss. A few days’ exposure is already producing anticipated fading at visible wavelengths at and around absorption maxima for the dyes. This pilot project, which completes at the end of June, will test our experimental approach and identify visible light wavelengths to tune out in LED lighting for light-sensitive dyes. By then MPhil Textile Conservation student, Michelle Hunter, will have her dissertation research underway to assess real-time chemical and colour changes to magenta dyed fabrics exposed to different room and display lighting. Outcomes from the pilot study and Michelle’s dissertation will shape the fuller Filtered Light Project, which will also consider the aesthetic impact of tuneable lighting on dyed textiles. The project team expresses sincere thanks to: the Textile Conservation Foundation for funding this pilot study and Napier University School of Arts and Creative Industries for purchasing the bandpass filters; Dr David Saunders (formerly British Museum and recent guest scholar at the Getty Conservation Institute) and Joe Padfield (National Gallery, London) for supportive and informative light-ageing email discussions; David Thomson (Glasgow Museums) for stimulating display lighting conversations; and Christopher Iannarelli and Linda Ramsey (National Record Scotland) for the expertly-cut natty acid-free card holders for the bandpass filters.